The concert featured the outstanding young Slovenian soloist Lana Trotovsek. Lana began playing the violin when she was five and went on to win many top prizes for young musicians in her own country and further afield. She studied at the Academy of Music in her native Ljubljana and has recently been studying as a postgraduate Advance Diploma student at Trinity College, London. She was awarded 'The Friends in New York' prize and was invited to perform the Khachaturian Violin Concerto with the Belgrade SRT Orchestra in 2007. 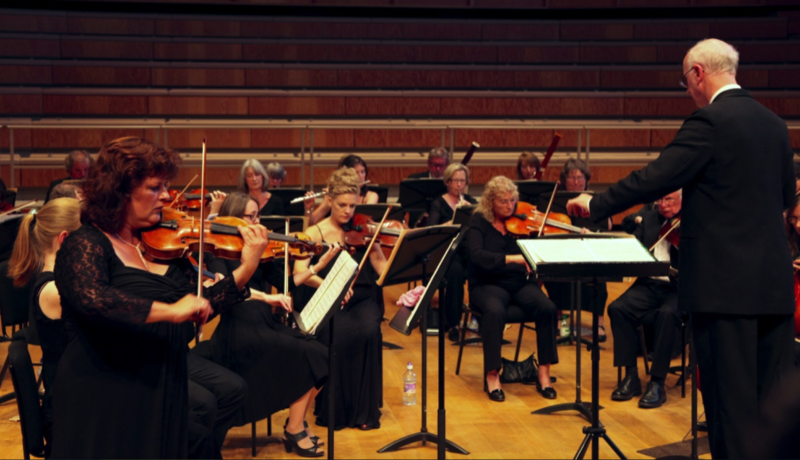 "a concert full of delicate playing and gentle nuance"
The Canterbury Orchestra, under their conductor Andrew Lowen, brought the joys of the countryside to the audience in St Peter's Methodist Church, Canterbury on Saturday in a concert full of delicate playing and gentle nuance. Most of the programme was pastoral music, with the exception of the opening Wasps overture by Vaughan Williams. It was taken at impressive speed and the strings, confidently led by Chris Brown, coped splendidly with the wit and dynamic range required by the score. In their turn, the wind thrilled the audience with some lovely phrasing of these most English of tunes, leading to a climax which brought calls of approval from listeners. The overture was follwed by two pieces by Delius - On hearing the first cuckoo in spring and Summer night on the river - which both pieces of impressionist tone painting which require tremendous teamwork to manage the relationships between soloists and the complex scoring of the strings. The challenge was more than met with fine undulating solos from flute and oboe over the well phrased if perhaps slightly forced string harmonies. The first half ended with the richly tuneful Banks of Green Willow masterfully shaped by the conductor. It is great credit to this group of players that so much music which relies on emotional rather than dramatic climaxes come across so satisfyingly. The second half continued the rustic theme with Beethoven's Pastoral Symphony. Here is another piece that allows no room for error. The strings did not disappoint, with assured playing of the gentle intersecting melodies. As the Symphony develops to reveal the antics and feelings of the villagers, bassoon, horn and clarinet all delighted with moments of grace and humour. The evening was brought to a splendid climax as the excellent brass and percussion firmly brought this stimulating performance to a stirring end.